Tax Jurisdictions are required to perform periodic Re-Assessment/Re-Valuations ("ReVal") to ensure that the tax rolls are fair and equitable. Considering most Revals require very specialized logistics, the customary practice is to hire (after proper vetting, etc.) 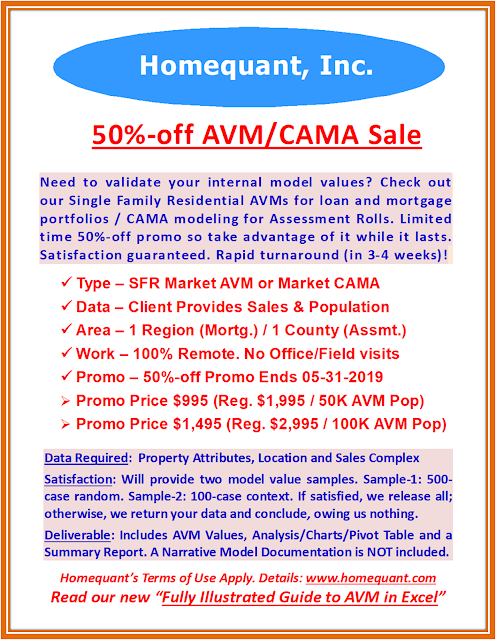 a well-qualified vendor ("Vendor") performing the two primary functions - data recollection and revaluation of each property on the roll. In case of a major ReVal (after a significant time gap), the IT piece (software facilitating the data warehousing, retrieval, mapping, valuation and notices) is also reconsidered. While the revaluation component is more or less the industry standard, the level of data recollection (e.g., whether to recollect the interior data, etc.) is usually case-specific, depending on the scope and frequency of each ReVal. For the ReVal to be meaningful, a valuation committee comprising experts from both sides of the aisle - Assessment and Appeals - needs to be in charge to provide supervision and technical expertise. Ideally, the committee should also invite prominent local citizens - Finance/Econ Professor(s), Newspaper Editor, RE Board President, CEOs, etc. While the hiring of a Vendor is a must, giving them unrestricted and unchecked domain of authority could be disastrous. It's always prudent to hire Review Consultants ("Consultant" - residential and commercial) alongside the Vendor. In order to keep the review costs down, the role of the Consultant could be "primarily" statistical, meaning they would be validating the recollection and revaluation at the statistical level (top down), without duplicating any of the Vendor's baseline work. In fact, the RFP must clearly spell out the separation of the review responsibility from the primary work so that the Vendor is prevented from inflating the ReVal quote by adding a meaningless review piece at the end. In other words, by having the Consultant independently review the Vendor's work, the audit function is meaningfully separated from the accounting, so to say. 1. The Consultant must perform scientific sampling of the new data to validate the recollection, paying special attention to both ends of the curve. All major data changes - existing vs. new - must be investigated. Major data must be statistically defined before the curve is negotiated and established. For example, if the model shows Living Area, Age, Bath, Grade and Condition are the most important variables (must not be arbitrary), negotiation must take place internally as to how to limit the Consultant's role. If the review budget is quite limited, the role of the Consultant could be restricted, for instance, to the statistical definition/validation of the top two variables - Living Area and Age. Of course, once the scope is statistically defined by the Consultant, the actual validation of the data - field and desktop - must be performed by the assessing staff. If the Consultant's role is limited, additional data verification along those definitions must be internally undertaken as well. 2. Location, View, Block type and GIS must be reviewed internally by the assessing staff as these are more straight-forward desktop verifications. If the Vendor uses School District and Neighborhood or Census Tract and Census Block or Zip Code and Zip plus 4 variables in the model, they must be verified as well. If the jurisdiction's School District is the classic representation of their "fixed neighborhoods," any switch must be vigorously investigated, otherwise the proposed value changes might be hard to justify and defend. Therefore, in the event of a well-established (classic) fixed neighborhood, the Vendor must receive approval from the valuation committee before making any such changes. All pre-approved fixed neighborhood variable(s) must also be shared with the Consultant so all participating parties converge on the same page. 3. Many ReVals fail due to the Vendor's poorly-developed Mass Appraisal models (e.g., non-representative Sales GIS). It is therefore imperative that the Consultant (independently) develops their own version of the challenger market models, holding the location, view, block type and GIS variables constant. To clarify, the Consultant must not try to just mimic the Vendor models and reproduce their values; rather, they must develop their own models using their proprietary methodology, leading to "their" set of challenger values and comparable valuation metrics. 4. Once the Consultant applies the models on to the population and generate all values, they must compare theirs with the Vendor's draft values as well as the prior roll values (it must be the jurisdiction's responsibility to make the Vendor's draft values available to the Consultant to ease/accentuate the review process). Most importantly, the cascading variances (by buckets, i.e., 30%, 20%, etc.) between the Vendor's draft values and the prior roll values must compare very favorably with the Consultant's. In addition to the statistical variances, a series of parcel-level random and context samples must also be considered. Parcel-level samples will help minimize the incidences of compensating errors across statistical buckets (must!). 5. If the aforesaid variances are large and non-converging, a series of stratified random samples must be hand-worked (comp'd) by the assessing staff. If the sample values are skewed in favor of the Vendor's, the model values should be sent to the valuation committee for certification. Alternatively, if the sample values validate the review models, the Vendor models must be sent back for rework, along with the review notes from the Consultant. Ideally, both parties - Vendor and Consultant - should submit small samples of (comp-based) workups justifying their respective model values and the resulting variances. 6. The Consultant must also investigate that the IAAO model standards (in terms of vertical and horizontal equity) are properly complied with. The Vendor models must also be applied on to forward sales samples to ensure that they are inherently efficient and accurate, producing very similar results (COD, PRD, etc.) as the original models. Of course, the forward sales samples must be representative, with possible time corrections back to the valuation date. Outliers should be removed to make the comparison apples-to-apples. This additional review step will thus emphatically ensure the absence of any sales chasing and/or model irregularity. Any significant deviation must be reported to the valuation committee. 7. When the Vendor models are reworked, the revised modeling results, along with the new sample workups, must be submitted to the valuation committee who would then reiterate with the Consultant and the assessing staff for re-validation. If and when the updated data (not variables) are used in the revised modeling, those data changes must also be shared with the Consultant, allowing them to re-apply their models and regenerate values. If the model revisions are extensive, the Consultant might redefine the original schematic including some review parameters. 8. One way to keep the review budget manageable is to leverage the appeals staffs, allowing some of them to work with the Consultant, considering they bring significant review expertise to the table. The review documentations could also be handled by the appeals staff, saving the jurisdiction a significant amount of money. Working up the (comps) samples is another area they could be of big help. Also, by allowing access to the site licensing of the statistical software (e.g., SAS) could help lower the review budget. 9. Last but not least, for the ReVal to be successful over time, the jurisdiction should seriously consider setting the valuation date back to a historical date, thus taking the bite out of the futuristic gamble. The backward-bending valuation date makes the "info" playing field level, allowing equal access to market info to the jurisdiction vis-a-vis the counterparties. Going forward, the assessing staff would be developing more efficient models, producing more accurate values and managing the valuation cycles more meaningfully and predictably - making the large volume of protests a thing of the past. Of course, the change in valuation date may require amending the charter (well worth the effort!). Today, a qualified Review Consultant is germane to a successful Reval.